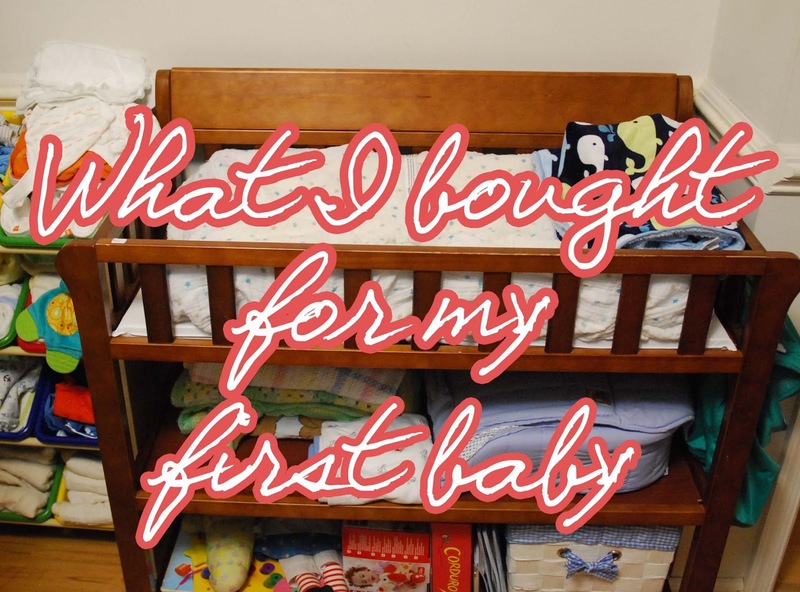 This is a comprehensive list of everything I bought before giving birth to our newborn. It's not that long of a list, at least I don't think so. I tried to only buy what I really thought I needed and not give into the hype of purchasing All The Things. For example, we did not buy a crib or a bouncy seat or anything that rocks a baby. I plan on wearing this kid---my mom bought me a moby at my baby shower and that is just how it's going to be. We spend $400 on everything. I don't know if this is the norm, or if it's more than most spend, but it's how much we spent. We also just bought everything all at once--no here or there buying. One day. One (or two) orders. Streamlined! 1) For sleeping I bought a cosleeper. The exact one I purchased (after reading a ton of amazon reviews) was the Arm's Reach Concepts Co-Sleeper Bassinet . This contraption can be used as a bassinet or attach to your bed as a co-sleeper. It's also the most expensive item we purchased. We also bought (separately) the Arm's Reach Organic Fitted Bassinet Sheet for the Co-Sleeper. I wanted to buy the one made by the same company, for safety issues (so not to mix and match brands) and I also wanted an organic one. It was only a few dollars more than a non-organic cotton one, so it didn't break the bank. 2) We found a used changing table at a thrift store (and my amazing mom bought it for me) but I had to buy a changing pad. I got the LA Baby Countour Changing Pad . I also bought a 2-pack of the Organic Waterproof Quilted Lap and Burp Pad Cover to lay on the changing pad under little man's bum so he doesn't ruin the pad if he happens to, uh, have a blow out in the middle of me trying to remove his diaper. The two pack was nice, because I can keep one of the covers upstairs to change him and the other downstairs, or have one to switch in and out if washing. 3) We are doing cloth diapers. This is the one of two thingsI did not buy from amazon, but instead from Green Mountain Diapers. I bought 24 prefolds in the small size, unbleached, and three Flip diaper covers and two Blueberry Capri Covers. We are very excited about cloth diapering! From amazon, I bought a cloth diaper Kanga Care Wet Bag to store things in before washing, and a Clip and Drip Hanger to hang dry our diapers. I'm sure I'll make more posts about cloth diapering. 5) I bought two splurge items. The Roll Around Toy Hedgehog and also the Hape Walk-A-Long Puppy . They were just too adorable to pass up. I hope my son likes them! Another random item I bought was a ear thermometer. I wanted something that would easily take my son's temperature in case of sickness! (like a 1 Second Ear Thermometer ). 6) The only clothes I bought were two nightgowns with "mitten" attachments to go over his hands. I bought 2 Pack Neutral Ducks Shoulder Gowns for my son to wear at birth. The gown part makes for really easy diaper changes and the mittens will help him not scratch himself. I also bought a pack of mittens for home use to go with his other outfits. (4 Pack Mittens ) I got so many clothes at my baby shower--I think we are set for at least the first 6 months. 7) Lastly, we bought the Infant To Toddler Tub with Sling for bath time and a Munchkin Dandy Dots Bath Mat to make sure the bottom of my bathtub isn't slippery if I happen to hold baby in the shower. 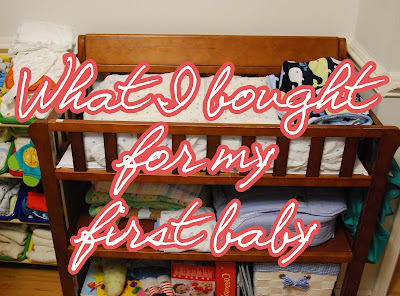 What did you end up buying for your baby? The only thing I am thinking of buying is a wire drying rack... for drying diapers outside in the sun...but not sure about that yet!